Several groups of Gray Whales and Humpbacks are still about 1/4 mile off shore from Todos Santos. The whales have many calves and have been very active, the Humpbacks have been doing lots of breeching and tail slapping! The Gray Whales which arrived after Humpbacks come up incredibly close to the pangas. The Grays also like to get verticle and have a look around (this is called spy-hopping). Please contact us for further updates or to reserve your excursion. 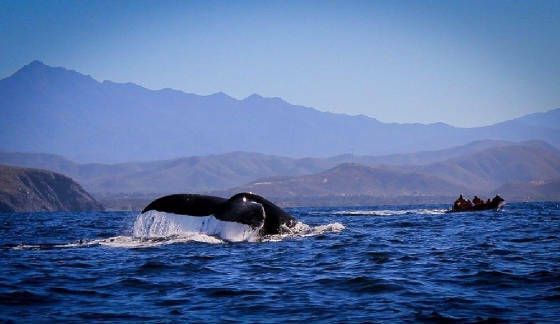 Humpback and Gray Whales give birth every winter in the lagoons just north of Todos Santos. 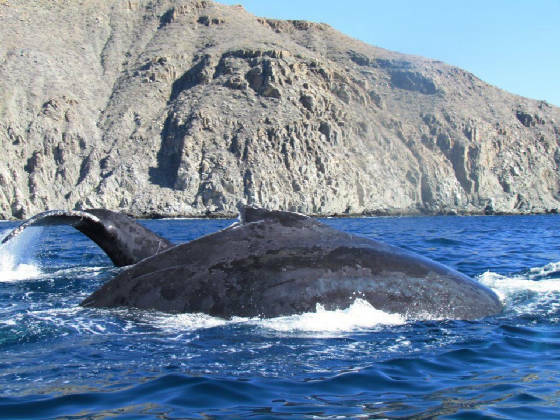 Mothers and their calves then travel south and can be seen feeding and frolicing amazingly close to shore in Todos Santos as they prepare for their long journey north. Songs of humpbacks can even be heard as they pass below the pangas. These incredible animals have learned that man is no longer their enemy and surface often to show off a new calf. 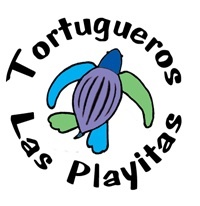 Sightseers also have the opportunity to see dolphins, sea lions, and sea turtles, manta rays and more. The launch and return to Punta Lobos is as exciting as the wildlife you'll see! Most excursions will launch at 7:30 am, there is a possibility of a second trip at 10:30am, depending on conditions. Rates this season will be per charter instead of per person upon request of the fishing cooperatives. $295 usd per Charter for up to five people. If you have just two people or three people in your group we can usually pair you up with another couple so you can share the price of the charter. Please email us to let us know you want to join another couple. Multiple Pangas can easily be reserved for large groups. A deposit of $100usd is requested to reserve your Whale Watching charter. The remainder can be paid in cash or through paypal, whichever you prefer. Conservation of Endangered Species and their Habitats.